As a flavorist and food technologist, I have been extremely fortunate in my career. A large part of my work is tasting products. Evaluating Greek yogurts on the market has been a treat. Especially when it comes to Fage. It is one of the more expensive yogurts on the market, sometimes listed at $1.89 and it is delicious. I recently tried two flavors (1) Strawberry with 2% milk fat and (2)Cherry Pomegranate with 0% milk fat. 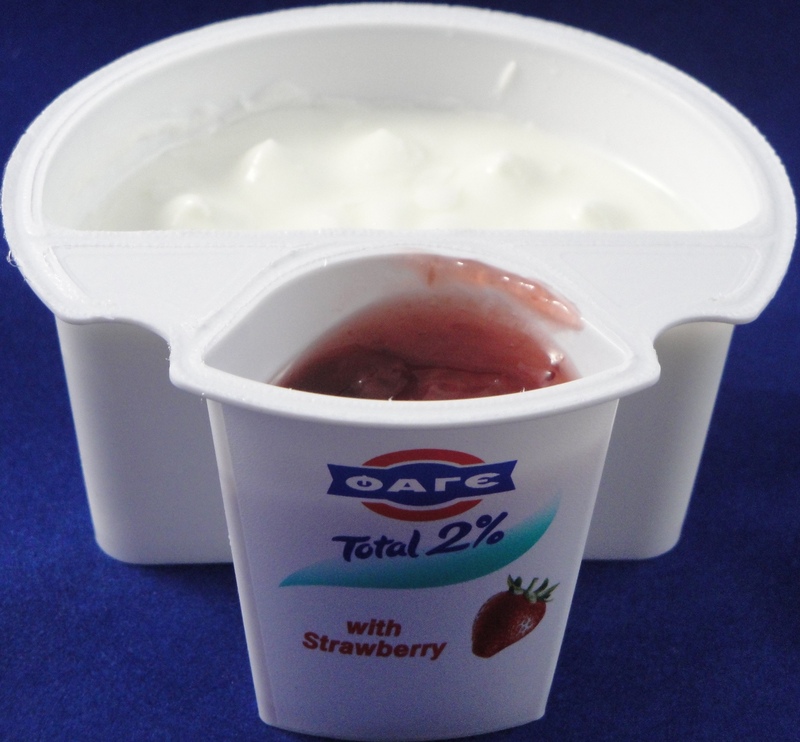 Fage yogurt is uniquely packaged, with two cups; one large cup for yogurt and one small cup for fruit. The serving suggestion is not to stir. Therefore, I scooped out a little yogurt and dipped it in the fruit. The 2% milk fat Greek yogurt that came with the strawberry fruit was amazing: creamy like butter and mildly tart. 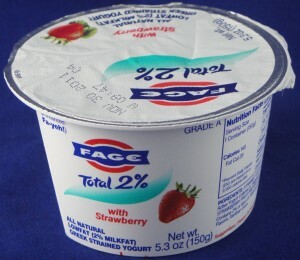 In fact, the 2% milk fat Greek yogurt tasted like sour cream and I would consider substituting it for sour cream in recipes. I was a little disappointed in the strawberry fruit, though, it had the moldy/phenolic character that I sometimes pick up in strawberry jam. I suspect this is a quality issue related to the supplier of strawberry juice concentrate. The 0% milk fat Greek yogurt that came with cherry pomegranate was again amazing. I felt it was more sour and cheese like than the 2% milk fat Greek yogurt and it reminded me of cheesecake with the cherry topping. I loved the cherry pomegranate topping, although, I felt it was mostly cherry flavored. The cherry had nice peel notes and was extremely authentic. I’m impressed! A concern over evaluation of this yogurt is that each consumer would combine the fruit and yogurt at different ratios. Therefore, opinions might vary. However, it is nice to allow the combination of fruit and yogurt with the consumer. Everyone has different tastes. My children love this yogurt. They recognize it in the store and specifically ask for it. I only get it for them when it’s on sale, but I’m proud of my kids for having good taste.